Mountain Park is using Smore newsletters to spread the word online. Report Cards are coming home TODAY! Please be looking for it. You can keep the contents of the envelope, but please sign the envelope and return it to school with your child. I am excited about the growth that I have seen in students and am excited about how they are beginning to apply what they have learned. Moon Phases never tasted so good! 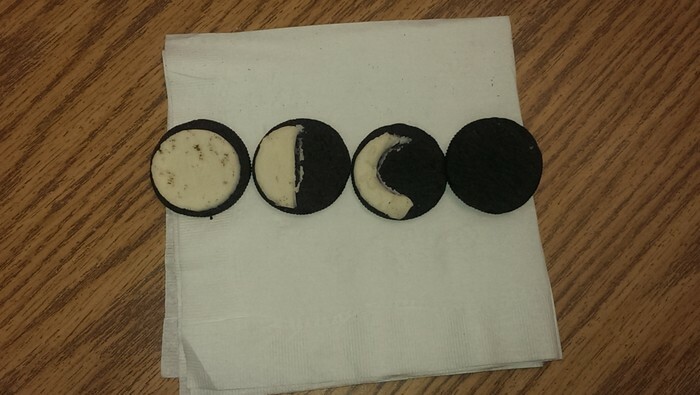 This week while learning about the day and night sky we created the phases of the moon with Oreos. Yum! In reading, we will focus on retelling stories. When we retell, we talk about the characters, setting, and major events in the story. It will be so helpful for your child to retell the story to you every night. Don't stop there, though! Your child can also practice retelling after watching a television show or movie! For Writer's workshop, students will continue to write opinion pieces. We are teaching students to use reasons to support their opinion. Teachers will begin to collect writing samples to show you at the February conference. In math we will continue discussing and learning about 2D and 3D shapes. It is important that students begin to recognize shapes in the world. In social studies, we will be learning all about the life of Dr. Martin Luther King. Kindergarteners will need to be able to tell someone that MLK believed that all people should be treated the same and that he was from Atlanta. Don't forget there is no school Monday, January 18th in observance of the holiday. Students are beginning to learn about vowel sounds. Please review these at home with your child. It is important that students be able to recognize and produce correct vowel sounds in their reading and writing. This week's sight words (that, bed, big, not, and but) all contain short vowel sounds. Thank you again for all of the Happy Birthday wishes! The children made my day, and I can't wait to buy some new books with my Amazon gift card. Don't forget we will be celebrating Mrs. Ruffing's birthday Tuesday, January 19th. Friday, January 22nd is the 100th Day of School! 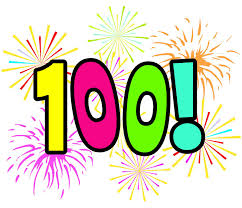 MPES will celebrate all day long with 100th day activities. This year we will be dressing with 100 of something (of your choice) on our clothes! Be sure this is something tht your child can wear all day long. Each grade level will have a winner for the most creative outfit. There will also be a school parade.